Our walk, more a meandering stroll, starts on the riverfront at the Cutty Sark and Gypsy Moth. The conspicuous dome shaped building is the entrance to the foot tunnel under the Thames . The even more conspicuous dome downriver is the Millenium Dome. Lets start off by walking east along the riverfront (river on our left) past the magnificent baroque buildings of The Dreadnaught Seamans Hospital and the Royal Naval College, now Greenwich University. The Trafalgar Tavern (1837) and The Yacht pubs are ready for refreshments if your flagging already! Turn right up Park Row, cross the main road and contine to the end to enter the Queen's House grounds on your right. Walk through the grounds and along the colonade to The National Maritime Museum (entrance of the river side of the building). Across the road, surrounded by traffic, is Greenwich Covered Market (1831) full of craft shops and quality market stalls at the weekend. An excellent place to buy gifts to take home. Note the Nauticalia shop on the corner, the "first shop in the world" at 000 00.4' W ! You might want to leave making any bulky purchases in the the market untill later as we are now heading off up hill. Backtrack to King William Walk and dogleg right into Croom's Hill. Past Greenwich Theatre and The Doll Museum and pleasant period houses until the church is reached , then enter Greenwich Park at Croom's Hill Gate and follow the path ahead until it meets the road. Turn left along Blackheath Avenue to the Royal Observatory buildings. (there is a fan museum at 12 Crooms Hill). After visiting the Observatory you can either return downhill towards Queen's House after enjoying the view across East London. However if you fancy a brisk walk (1 mile) and a change of scenery return to Blackheath Avenue and carry on right out of the park at Blackheath Gate and head off across Blackheath to Blackheath Village (aim for the prominent church). Blackheath is full of pubs and restaurants and if you do not wish to return to Greenwich you can take a train back to central London from there. A note on security. The Borough of Greenwich is a mixed area and although I have not heard of any incidents concerning tourists may I suggest you stay in the "nice" areas. 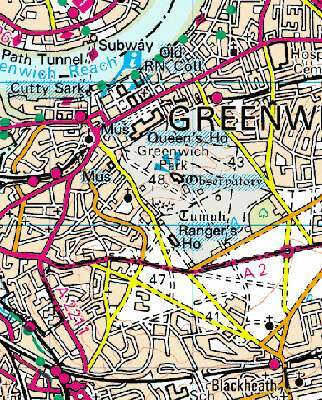 This is of course most of Greenwich and Blackheath, these are after all probably the most desirable areas in south London. Just for my peace of mind play safe and don't go wandering into public housing estates waving expensive video cameras about. The area i'm thinking of is upstream on the river front beyond the Cutty Sark and Gypsy Moth (below the words "Cutty Sark" on the map). It's a tiny risk but its best to err on the side of caution. Greenwich or Blackheath rail stations or riverboat is one hour from Westminster Pier. Using the foot tunnel it is 2 1/2 miles to Limehouse basin on foot along the north river bank to connect with the Thames walk. You will find food in the pubs mentioned and those around the market, where there are also a variety of restaurants. Once you could queue for a pie at Goddard's Pie House, 45 Greenwich Church Street but now theres only a mobile shop for the moment.